I derive an enormous amount of pleasure from riding part of a Tour stage ahead of the peloton. Today dawned bright with that omnipresent bitingly cold wind. As we rode into Briançon you could see the fresh snow on the surrounding mountains. With a fair tailwind, it didn’t take too long, despite the presence of an enormous amount of traffic, to reach the town in full-on Tour party mode. We followed today’s route taking La Chaussée (1.7km @ 8.3%), which had me perspiring heavily beneath my jacket, gilet, shirt, vest and bib, followed by the climb up Montgenèvre (7.9km @ 6.1%) and then we rode back: a 40km round trip. It was like one big international pointage with riders from all over the globe riding up and down the road which was wide but with a significant amount of traffic. I was almost sideswiped by a Polish caravan. As one of only a handful of women , as usual, I received plenty of encouragement from those on the side of the road. Again, there was barely room left to park a moped, let alone a camper van. And, it’s official, Denmark, Norway, Belgium, Holland and Luxembourg are deserted. They’re all watching the Tour. Given the weather forecast, we had planned to watch the race at the finish in Pinerolo but it wasn’t necessary as the outlook was warm and sunny here, provided you stayed out of the wind. We returned to Briançon and watched the race unfold on the large screen. 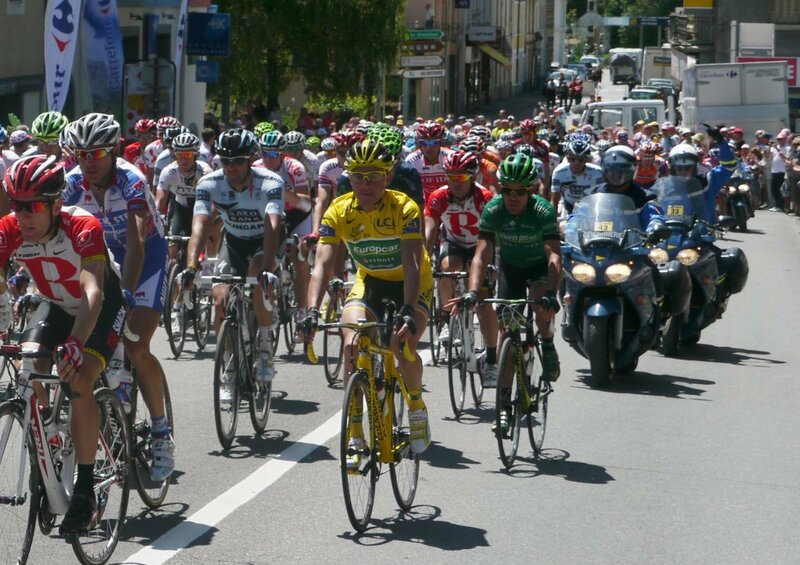 We saw the riders ascend the Chaussée at a positively pedestrian pace. They must have been saving themselves for the forthcoming mountain stages. French aspirations for a home stage winner were raised by Quickstep’s Sylvain Chavanel, one of today’s breakaways, only to have them cruelly dashed by today’s stage winner, Sky’s Edvald Boassen Hagen. Two Norwegians in the Tour and two individual wins apiece: Norse Gods rock. Meanwhile, on the descent into Pinerolo, the yellow-jersey wearer, Europcar’s irrepressible Tommy Voeckler was struck by the curse of the commentator. Just as he was being complimented on his strong descending skills, he veered off the side of the road. He remounted, having lost touch with the leading riders, only to replicate Jonathon Hivert’s mistake of overshooting a corner into someone’s drive. Bertie and Sammy, that well-known Spanish double act, again tried to put time into the competition on the descent into Pinerolo but the other contenders caught them on the line. Today’s only casualty was Tommy who lost 27 precious seconds. He may rue that come Paris. None of the jerseys changed hands. Two fantastic medium mountain stages, in both cases animated by Alberto. I find myself warming to him again, while the Schlecks just irritate me more and more with their whining about the descents. I appreciate the safety concerns – particularly in the post-Weylandt aftermath – but you don’t hear the sprinters complaining about how dangerous bunch finishes can be, do you? Basso also lost 27 seconds, although he hasn’t really been a big podium threat this time around, has he? EBH makes the current score Norway 4, Isle of Man 4, Rest of the World 8, France 0. But I guess the French have been too busy celebrating Tommy’s 9 days in yellow to worry about that too much? Hopefully the snow on the Galibier will clear before tomorrow afternoon. It will be such a shame if they have to cut this most epic of epic stages short. This is eaxctly what I was looking for. Thanks for writing!